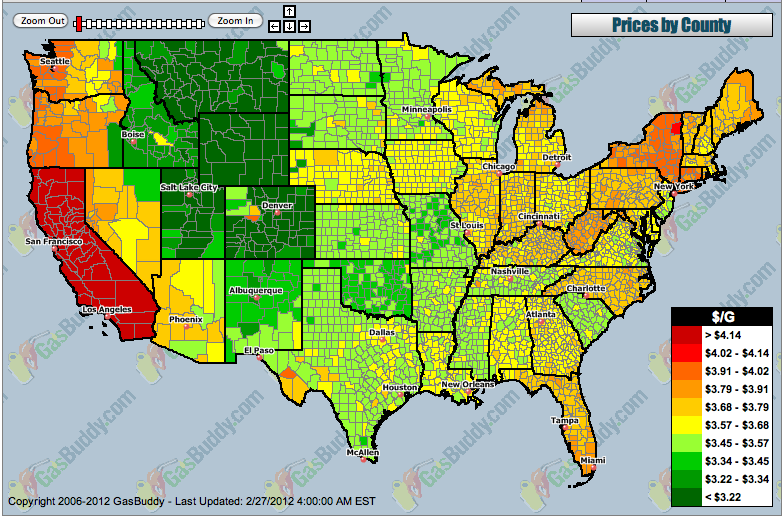 Early Warning: Why are Gas Prices High? Gas prices are going up again, resulting in a lot of discussion by people who don't normally think about the oil markets, and therefore aren't necessarily that well informed about the subject. As a certified oil-obsessive these last seven years, I thought I'd put up a "cheat sheet" with just the key graphs that would allow you to understand the major forces that affect the behavior of gas prices over time. No fair! the exasperated consumer cries. So why is this? You can see that there's a very strong relationship over time. 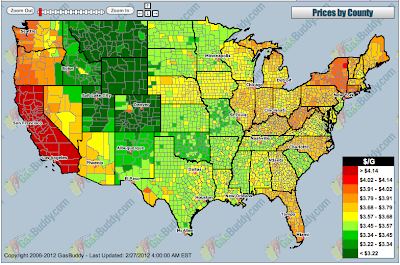 Technically, 97% of the variance of the price of gas is explained by the price of oil. Less technically, the blue 45 degree line is what would happen if gasoline cost exactly the same as the bulk price of the oil in it. The blue dots are what it actually cost. The difference is what refiners and distributers and retailers get (what in oil industry terms is called "downstream"). You can see that by and large the downstream industry gets a minimum of about 75c a gallon - occasionally they are able to tack on an extra 50c or so, but not consistently. The vast bulk of the price of a gallon of gas is going upstream - to the folks who own and extract the oil from the ground. (Data from BP). 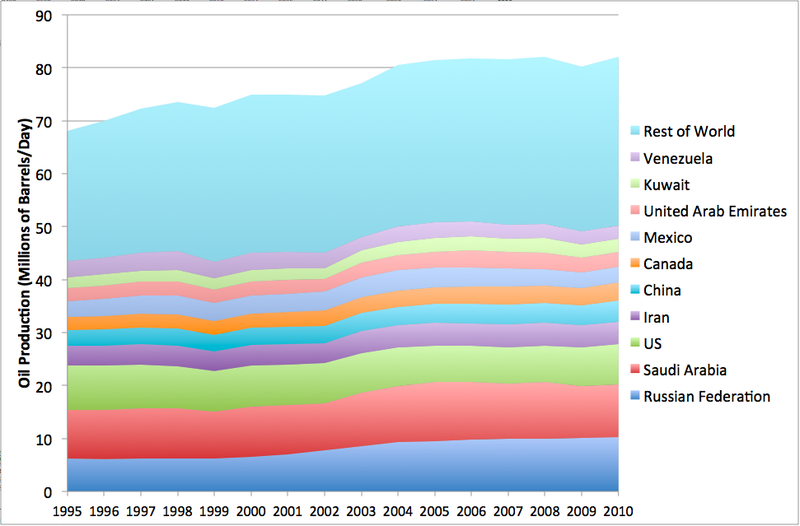 You can see that the top two by far are Russia and Saudi Arabia, and OPEC countries dominate the rest of the list too. Note particularly the prominence of unfriendly countries like Iran and Venezuela. With the partial exception of the US, western countries are bit-players as oil sources at this point, So most of the oil revenue is going to semi-friendly or actively hostile countries - and by and large all those countries nationalized their oil reserves long ago and either don't use western oil companies at all, or pay them a moderate fee per barrel and keep most of the profit. So while it's certainly true that the big western oil companies (Exxon, Chevron, Shell, etc) make a lot more money when gas prices are high than when they low, those companies aren't the main cause of the problem. 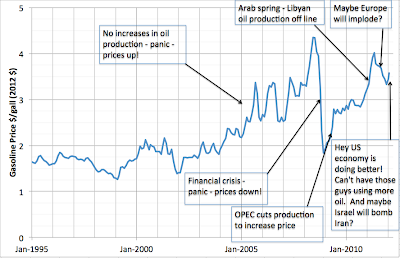 The main cause of the problem is staring you right in the face in that graph above - roughly speaking oil production stopped increasing in about 2004. Historically, most of the time2 as economies grow, more houses, offices, and factories get built on the edge of towns everywhere, people buy more and bigger cars, and oil demand increases. Generally, when the economy increases in size by about 10% (as measured by GDP) oil demand increases by around 6% or 7%. 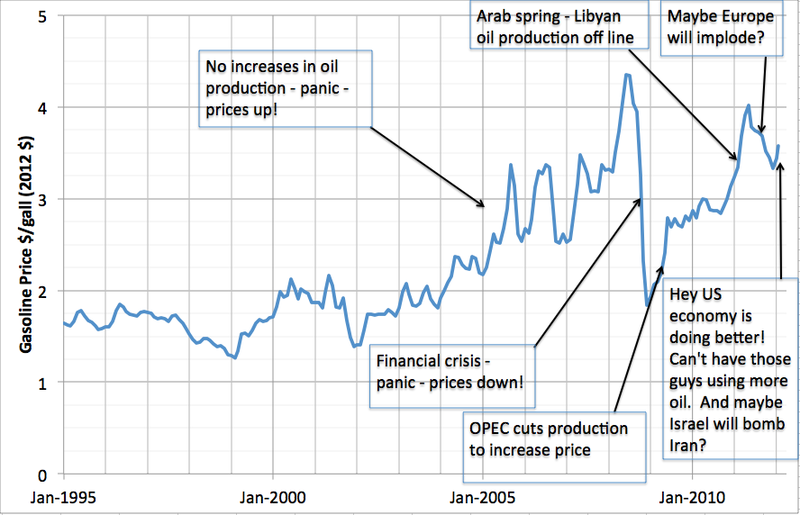 Usually in the past, oil production has increased as a result. However, lately, it's become harder and harder to find ways to increase oil production. 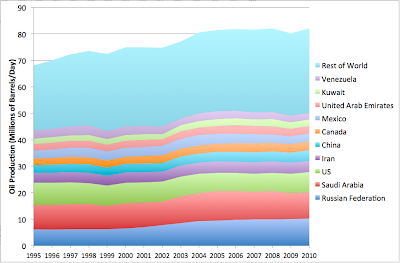 In particular, you can see that both Russia and Saudia Arabia were increasing production in the late 1990s through 2004 and that was a lot of the increase in total global production. 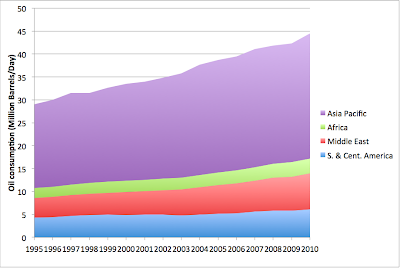 But since 2004 they are roughly flat. Comfortably over half of global oil is now going to these regions. So the US and Europe, who traditionally used the lion's share of the planet's oil production, find themselves squeezed between flat global production and rising developing country consumption. Under these circumstances, gas prices will continue to be high and volatile - and indeed will very likely go higher yet before we are through. US and European consumers are going to have to conserve more and more oil - there's just no two ways about it. There's a reason that just about every car company is experimenting with electric cars. 1. Technically, this was done using the CPI less energy from the BLS and adjusted to Jan 2012 price level. 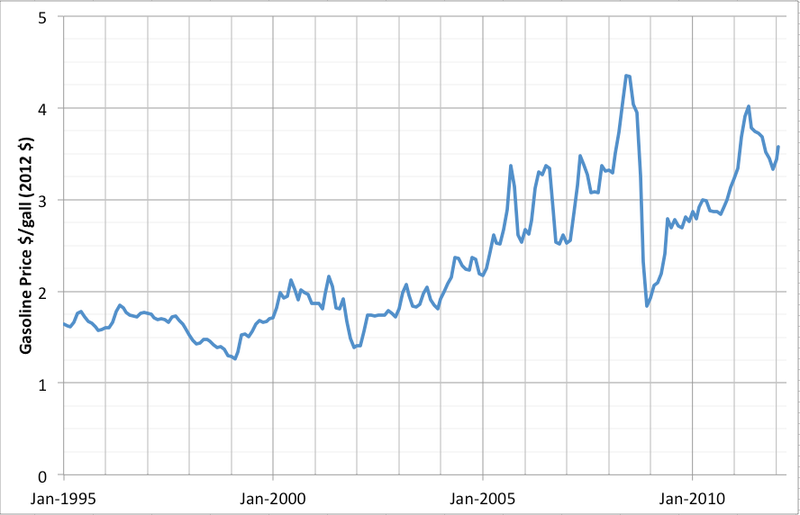 Gas prices are monthly retail all grades national average from the EIA. February is extrapolated from the weekly data. 2. The seventies were an important exception when major supply disruptions caused economic disruption, conservation efforts, and a reduction in oil usage. It's good to see you point out the apparently counterintuitive issue of utility and it's impact on demand from growing economies. Yes, nice post. 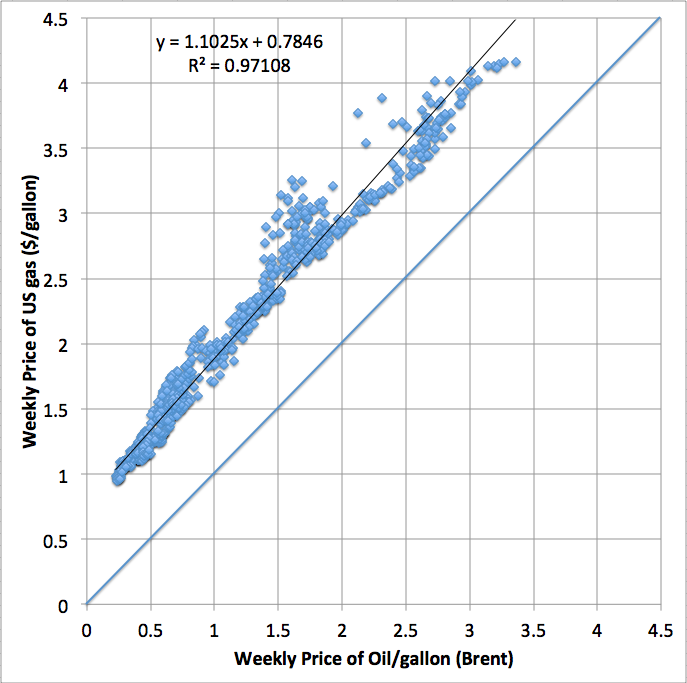 Do have a question though: notice that the slope of the gas vs. oil price line is not 1 but 1.2. Why is this? I can understand the offset - as you explain that is the profit for the gas refiners - but why should that "profit" go up as oil prices increase? RMD - the slope is 1.1 (1.1025 from the equation in the chart above) not 1.2. There's probably some inflation entering into it - that particular chart is not inflation adjusted (since it's not easy to inflation-adjust weekly data) and the low end is dominated by older data while the high end is dominated by more recent data. You. do. not. have. high. gas. prices. "If you think $4.93 per gallon is expensive, go outside and push your car 20 miles." Mr Sunshine - LOL - exactly. Mr. Sunshine, that comment deserves to be reproduced on a tee shirt! Hah, I pushed my vehicle 20 miles yesterday, including up and over a 300 foot hill in the morning. 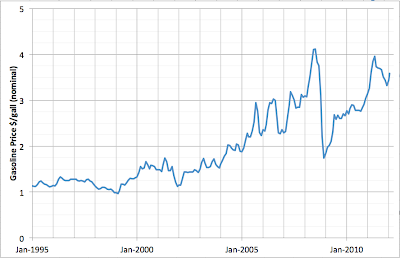 What is the effect of oil speculation on prices? People (Matt Taibbi etc..) who dismiss peak oil say the speculators cause the prices to rise. We need to deal with that argument.